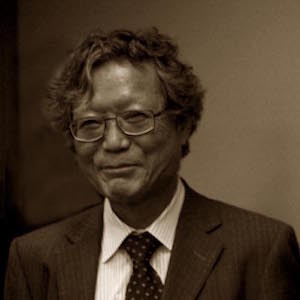 The story starts in the sixties, when Mikio Sato introduces hyperfunctions by algebraic methods with the dream to treat classical problems of analysis with the tools of algebraic geometry, homological algebra and sheaves, what he called "Algebraic Analysis". 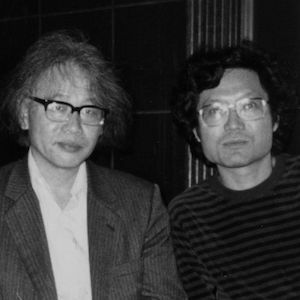 The most prominent student of the Kyoto school founded by Mikio Sato, is certainly Masaki Kashiwara. He first applied this philosophy to the study of linear partial differential equations in his Master's thesis in which he settled the foundations of analytic D-module theory and obtained later almost all essential results of the theory, culminating with the solution of the Riemann-Hilbert problem for regular holonomic D-modules. 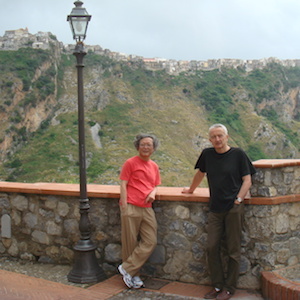 At the same time, he wrote with Sato and Kawai a long paper universally known as the SKK paper, the bible of analytic microlocal analysis, in which they construct analytic microdifferential operators and quantized contact transforms and obtain deep results, such as the classification of microdifferential systems at generic points and the involutivity of the characteristic variety. 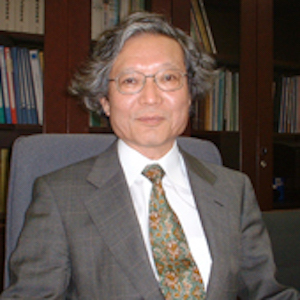 In the period 1980-1990 Masaki Kashiwara introduced and developed with Pierre Schapira the microlocal theory of sheaves on real manifolds. The microsupport of sheaves plays a role similar to that of the characteristic variety of D-modules and is involutive. On a real manifolds, the analogue of holonomic D-modules are the constructible sheaves, those whose microsupport is Lagrangian and Kashiwara has obtained a kind of Riemann-Roch theorem for such sheaves. Note that constructible functions, a byproduct of constructible sheaves, appear now in computational geometry. Microlocal sheaf theory has given a new perspective to microlocal analysis on real or complex manifolds, but is now adapted to arithmetic geometry under the impulse of Deligne and Beilinson. On the other hand, this theory appears since recently as an efficient tool for many questions of symplectic topology, after Tamarkin, Nadler, Zaslow, Guillermou and many others. 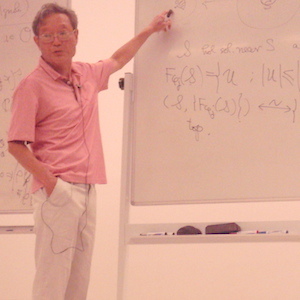 These topics cover only a fraction of Masaki Kashiwara's contribution who also obtained lot of important results in various fields, particularly in representation theory where he made a fundamental discovery, the existence of crystal basis for quantum groups, at the origin of a very intense and fruitful activity. He also introduced and developed (with P. Schapira) the theory of indsheaves, an essential tool in the study of the Riemann-Hilbert correspondence in the irregular case. 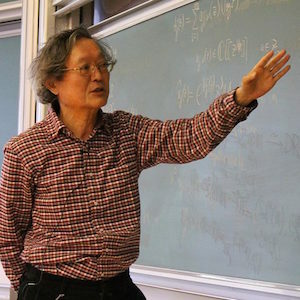 He also made (again with P. Schapira) a systematic study of modules over deformation quantization algebroid stacks, unifying D-module theory and complex analytic geometry. 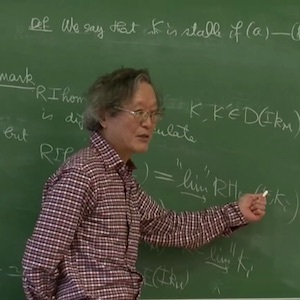 He applied this theory on one side with Raphael Rouquier to make a surprising link with Cherednik algebras and on the other side with Kari Vilonen to prove the so-called codimension three conjecture, a deep extension theorem for perverse sheaves.